As far as we know, Paleo Native Americans have always believed that everything in nature is not only physical, but also has a powerful spirit. Many archeological sites show that, as early as 10,000 years ago, Paleo Native Americans were wearing earrings made from natural materials such as walrus and mammoth ivory, found pebbles, shells, etc. Sometimes the materials had been worked into a different shape, but in most instances, such as in our Paleo Indian earrings, the naturally-occurring shape was not modified. The elongated, irregular shape of these earrings occurred by being tide washed on a rocky beach for much of its 6000 years. These earrings were probably thought to possess special powers of protection associated with the spirit of the piece. Our Paleo Indian earrings are the simplest embodiment of such spirit earrings. 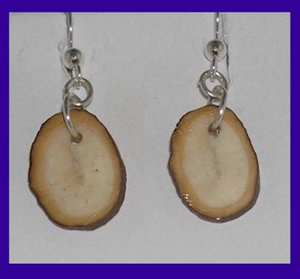 Made from a polished cross section of 6000 year old Fossil Walrus Ivory, and set with Sterling Silver ear wires. Just the touch for an informal afternoon. 5/8 inch high, 3/8 inch wide.